March Resource Round-Up – Leaping into Spring – and a FREEBIE! I’m sharing a few of my favorite March activities with you today. I cannot believe we are already heading into March! The post is long, but filled with all sorts of word work and writing fabulousness and a FREEBIE, too!! A couple of things happen when March rolls around each year. I get a little nervous that the school year is in its last stretch and yet there is so much left to do. And I get so excited that the school year is almost over and it is in its last stretch! I love changing my bulletin boards in March. Each writing activity my class does brings so much brightness to the room. I wanted to share a few of my favorite March resources. Celebrating reading during that final week of February always seems a bit odd. I mean, we celebrate reading EVERY DAY in first grade. To drive the point home, and welcome spring, we make leaping frogs. Frogs wearing bathing suits, reading a book, and wearing an optional hat. The kids LOVE working on this mini book report project. To make it extra fun, I hang them in a “pond” bulletin board with a few lily pads, a cattail or two and a log that says “Leap Into a Good Book”. In this picture, I had little Dr. Seuss stickers that I have each of them. They decided to use them on the back cover of the books they made. So adorable! For this activity, each student selects a book of their choice to do a book report about. Many chose a Dr. Seuss book, but not all do. I also make the hats an optional part of the craft. Mini-book reports are super easy and fun. They are a great way for early readers to get started with the basics of book reports: The title, author, favorite part, would you recommend it, etc. St. Patrick’s day is another one my favorite March days, and not only because it is my birthday! The kids get so excited talking about leprechauns. But there are plenty of other ways to have a great time with all the Leprechaun stuff. Check out this little cutie. It is such a great directed draw! Another favorite St. Patrick’s Day activity of mine are the Leprechaun traps! It is so amazing to so amazing to see what they come up with! Making traps is a fantastic stem activity, too! 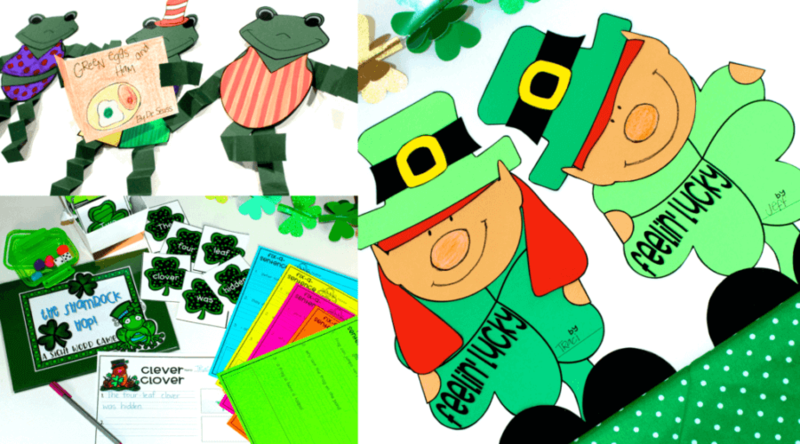 Of course, I have to include writing into my leprechaun madness, so another favorite March resource of mine is the Feelin’ Lucky writing lesson and craft. It begins with an anchor chart. From there we create an expository writing plan – our rough draft for the final project. We outline different things that make us feel lucky and give the reasons why. Because we’ve been writing with a plan all year, my kiddos are ready to not only give details that support the main idea, but describe examples and evidence of those details as well. Their paragraphs have grown from 5 sentences to 8 or more! As always, we end our writing lesson for the week with a craft. I recently updated these cuties and I LOVE them. They hold the kids’ writing AND look adorable on the bulletin board! I change out my word work once a month. It changes with my theme for the month as well as where we are in ELA. This March resource is filled with loads of word work fun! Un-scrambling sentences is a great way to build high-frequency word fluency, phonic/decoding skills and sensical sentence building skills. My kiddos play Clever Clover with and without the recording sheet. Collecting recording sheets from activities done during word work is a great way to keep tabs on their competency even when you are busy working with other children during small groups. One of my kiddos favorite word work activities is sight word board games. I change them out each month. This one is called Shamrock Hop. Each resource I have these in includes a game board that has words that I want my kiddos to work on AND a blank one so that teachers can use words of their choice! I use all kinds of things as game board markers including mini-erasers and linking cubes. Using colorful poms is great! There are so many colors to choose from and they are very inexpensive. Another great way to help students build high-frequency word fluency, phonic/decoding skills, sensical sentence building skills and correct grammar is implementing fix-a-sentences. We do these daily in our Morning Wake-Up, but I like to incorporate them in other areas, too. I found that this type of activity truly helps struggling and reluctant writers. The process of editing assists students in building writing confidence. Finding the problems helps them develop skills that ensure they won’t create similar problems when they write. You can do fix-a-sentence type activities anytime. Simple write a sentence filled with errors on the board and have students work to correct the errors and write it correctly on their white board or in a journal. They are a great “go to” when you need to fill a couple of minutes. Do you make your paper readers interactive? We interact with any text we are allowed to write on. It’s a great way to ensure your kiddos are getting the most out of reading. It also engages them in all facets of language. Underline the nouns in blue. Put a box around each detail that supports the main idea. Underline the verbs in red. Name two other adjectives the author could have used in that sentence. Help ensure reading success by asking more from your students than simply reading the words on the page. With the interactive reader in March Madness, students provide vivid verbs that describe the action of the tale. Students also illustrate their tale to demonstrate that action. I’m so excited to bring these cuties into my classroom over the next few weeks! You can find everything here over in my store. Just click the product covers below to find them! GRAB a March Poem FREEBIE HERE!